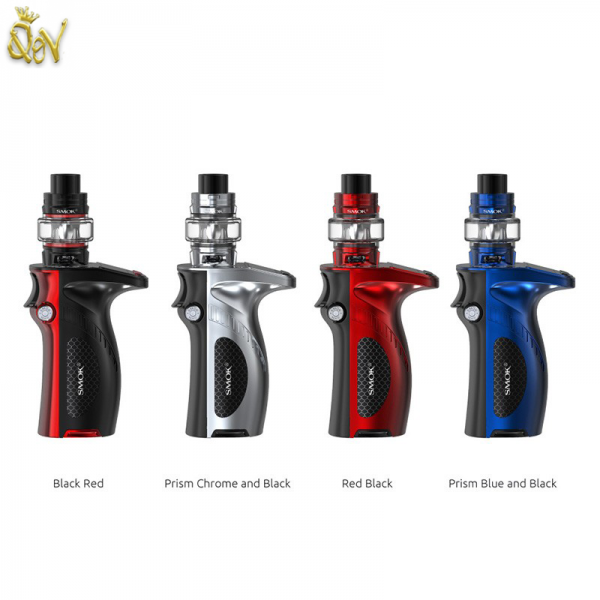 SMOK Mag Grip 100W Kit features a revamped and ergonomic chassis with a simplified UI with detailed vaping data and features the TFV8 Baby V2 Sub-Ohm Tank. The Mag Grip has been designed to integrate all of SMOK's newest and most cutting edge features, design, and output technology into a compact and visually striking chassis. The chassis features smooth and curvy faces with a redesigned ejectable battery door that holds a single 21700/20700/18650 battery(sold separately) with a press of a button to create one of the most striking box mod aesthetics today. Powered by SMOK's newest chipset, the Mag has an adaptive battery detection which changes maximum output based on current battery in use. The Mag Grip has a maximum of 100W with a 21700/20700 battery and 85W maximum output with 18650 battery. The Mag Grip also has variable wattage mode and comprehensive temperature control suite that packs in adjustable TCR as well as Preheat capability. This suite of features makes the Mag the most capable and versatile platform. User control for adjustment is implemented through a three button interface, a rich and more intuitive menu design is implemented for a more efficient use and easier adjustment control with a full array of essential data.The SMOK Mag Grip comes with the TFV8 Baby V2 Sub-Ohm tank is a new edition of the beloved and highly regarded TFV8 Baby Beast Sub-Ohm Tank. The Baby V2 Mag Grip Edition comes with the Baby V2 S1, a coil head with focus on lower wattage and more intense flavor. This single mesh coil head is rated at 0.15 ohm, has a wattage range of 40 to 80W and has a recommended wattage range of 60 to 70W. This kit also includes the S2 V2 coil head, created with a focus on lower wattage, intense flavor, and a more restricted airflow. This quad coil head is rated at 0.15 ohm, 30 to 70W, and has a recommended wattage output of 45 to 60W. The TFV8 Baby V2 is compatible with the rest of the Baby V2 coil family. On the base of the TFV8 Baby V2 is a noticeable triple airslot compared to the original TFV8 Baby. The SMOK TFV8 Baby V2 features the press to open top fill design that we are all used to and can accommodate 5ml of E-Liquid with the bubble glass tank section or 2ml with the standard glass tank section. The gasket located on the fill port section of the TFV8 Baby has been moved to the bottom of the TFV8 Baby V2, making the change a lot more of an easier process. The SMOK Mag Grip and TFV8 Baby V2 Starter Kit is SMOK's new flagship device that offers exquisite performance and gorgeous, ergonomic style. Battery Safety Use special caution when working with all Li-ion cells (Batteries), they are very sensitive to charging characteristics and may explode or burn if mishandled. Make sure the you have knowledge of Li-Ion rechargeable batteries in charging, discharging and assembly before use. Always charge in/ on a fire-proof surface. Never leave batteries charging unattended or overnight. Do not charge on carpets, couches, near curtains or other flammable items. Please be sure to use the correct specification charger with the correct device/ battery. Failure to use the correct specification charger could result in damaging the battery and/or explosion or fire. Just because a battery can be screwed into a certain type of charger does NOT necessarily mean it is the correct charger for the device! Never continue to use an e-cigarette if you can feel the battery get hot. If your battery gets hot to the touch, or if it begins smelling: DO NOT USE IT ANYMORE. Let it cool down (1 hour) in a safe environment (outside preferably), and dispose of correctly, or make arrangements to return, if still under warranty. If your e-cigarette or device begins activating itself, immediately remove your atomiser and disconnect the battery. Do NOT trust the battery, nor the atomiser anymore from this point on. This means never leave either of the components connected in your pocket, in your nightstand, or out of visibility where you can not immediately separate the two components. QoV are not responsible for damage if there is any modification of the batteries/chargers in any form or shape (including pack making). We are not responsible for any damage caused by misuse or mishandling of Li-Ion batteries and chargers. We will not be held responsible or liable for any injury, damage, or defect, permanent or temporary that may be caused by the use of any batteries.